Plus Size Halter Tops aren't as easily found right now as Plus Size Halter Swimsuits and Dresses. While the swimsuits and dresses are in bigger supply, there is a nice selection of halter tops available online. Halter tops are a great choice for warmer weather, they not only keep you cool, but accentuate your shoulders and upper back. If these are your favorite body parts - then go for it! Ashley Stewart has the largest selection of Plus Size Halter Tops online. Their styles tend to be younger and trendy and a lot of fun! Deb Shops also has a good selection of Halter Tops in Plus Size. They also have a great selection of Trendy Plus Size Fashion Tops. 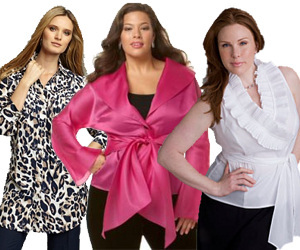 You can always count on Macy's to deliver upscale, trendy Plus Size Fashion Tops. Their brand names include Baby Phat, Calvin Klein, , Donna Ricco Jones New York, Michael Kors, Evan Picone and Ralph Lauren. Old Navy has a nice selection more basic halter style tops in plus sizes. 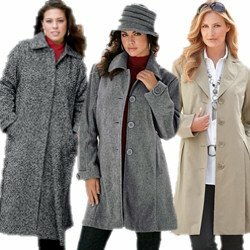 It is a great place to shop for classic and basic Women's Plus Size Tops, pants and dresses. They have their basic pieces, but do a good job of updating them for the current fashion trends season after season. By definition, a Halter Top is a sleeveless top that has straps that tie behind the neck. There are a lot of variations in they styles available. Some styles expose the entire back and others varying degrees of it. Most of the ones I am seeing now cover the upper to mid back. Some of them are really a strapless top with a string that goes from the center of the top and ties behind the neck. Except for the most casual and the dressiest, most halter tops can pull double duty in your closet. Many of them look as great with dressy pants or a skirt as they do with your blue jeans and shorts. With the right accessories, it will look elegant at your special event and look just as great at a casual warm weather setting. Palazzo Pants are huge in fashion right now - and they look really great with a pretty halter top. Just make sure you get a perfect fit through the shoulders, neck and bust. This style draws all the attention to you neck and shoulders. This is also a great style to get out your big hoop (or other style earrings). Also make sure you select the most flattering color for you for your halter top. With the right fit, color and accessories, you and your curves will be radiantly beautiful!